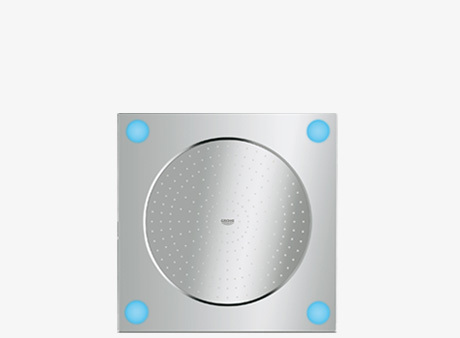 GROHE transforms the bathroom with F-digital Deluxe, a shower system that ushers in a new era of bathing experiences. 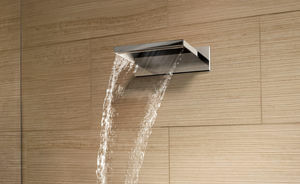 The modern marvel transforms the shower into a home spa by providing multi-sensory experiences via light, sound, and steam. The light module uses colored lights to change the ambience of the shower—the user can change the color and intensity of the light to suit the desired mood. 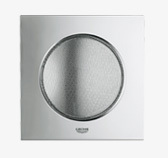 The system also enables its users to stream their favorite tunes from an iPad®, iPod Touch®, iPhone® or Android® device, meaning the shower can become the ideal spot to reenergize — or relax. What’s more, steam can be added to the experience, allowing the bather to detoxify and indulge in a completely sumptuous experience. The new F-digital Deluxe products turn your bathroom into an exclusive private home spa and create an experience that touches all senses and leaves nothing to be desired. Every aspect strikes a chord in you. You become fascinated and seduced by all that is possible. 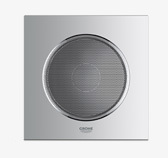 GROHE offers modules that will fill your shower with colored light or the sound of your favorite music. 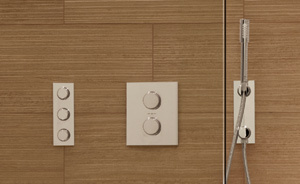 A compatible steam system* can also be added to complete the home spa experience. An oasis of relaxation and well-being awaits you at home. Use colored light to change the ambiance of you GROHE SPA shower. 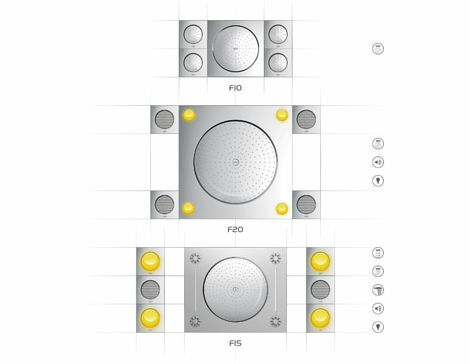 Use the F-digital Deluxe App to turn the LED light modules on and off or to change the color and intensity of the light to suit your mood. Relaxing or reviving? Stream your favorite tunes from an Apple® or Andriod® device and adjust the volume by using the F-digital Deluxe App. 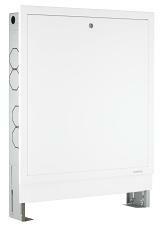 All products in the F-Series represent the freedom of design. 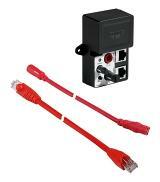 The modules of F-digital Deluxe can be installed to your personal preferences or be added to an existing system. 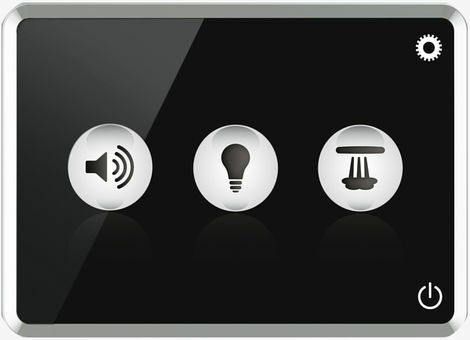 The GROHE F-digital Deluxe App permits finger-tip control of all module functions – i.e. colored and dimmable LED light, music and the intensity of the steam. This is yet another detail that highlights the unique flexibility that is an integral element of the GROHE SPA™ philosophy. The GROHE SPA® F-digital Deluxe App turns your iPhone® or Android® device into a convenient spa management system. The App lets you select different combinations of music, lighting and steam – creating a unique home spa experience every day. Simply download the GROHE SPA® F-digital Deluxe App to transform the system into an indulgent home spa. Download on the App Store or on Google Play. With just one touch you can transform your shower into your own personal spa – soft lighting, relaxing steam and your favorite music. iPod touch, iPhone, iPad and iTunes are Trademarks of Apple Inc., registered in the U.S. and other countries. Apple is not responsible for the function of this device or its compliance with safety and regulatory standards. Made for iPod® touch (4th and 5th generation), iPhone® 4, 4S and 5, iPad® and iPad® mini and Android devices. The Bluetooth® word mark and logos are registered trademarks owned by Bluetooth SIG, Inc. and any use of such marks by Grohe AG is under license. Professional bathroom design means presenting surprising possibilities all the time, tapping new potential and adding value to every bathroom. It also means developing products that enhance the quality of living and help you express your individuality. Diversity, multifunctionality and maximum comfort down to the last detail are the prominent characteristics of F-digital Deluxe, which, in combination with products from the GROHE F-digital or Grohtherm F series, let you enjoy the unusual to the max. This adds an all new dimension to the bathroom experience. 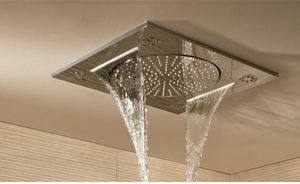 Showering on a whole new level.